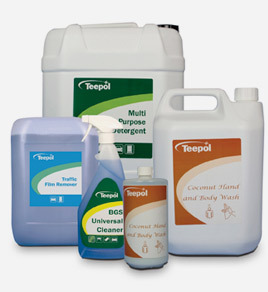 Over the years, we have developed and refined a vast range of different products, from dishwashing and floor care products, to specialist products for individual industries. Our pack sizes range from 50ml Pocket Packs to 1,000L Intermediate Bulk Containers, via 500ml Pumps, 1L Triggers, 5L, 10L and 20L Jerrycans and 200L Drums. Additional supplies such as granular salt, pumps, paper towels and dispensers mean we can cater for all customer requirements. Use the menu on the left or the search box at the top to find the products you want.